Adult male Beautiful Sunbird (Cinnyris pulchellus) in iridescent breeding plumage. Image credit: © Paul Cools at Internet Bird Collection and PBase. All rights reserved. Used with permission from the artist. Savannas, semi-arid or dry forest, wooded grasslands, riparian systems, villages and gardens. Less commonly, mangrove scrub and beaches. Thought to be common and widespread throughout its range, where suitable habitat exists. Thought to adapt well to habitat changes; uses human-altered habitats, such as gardens. Direct, dashing flight; acrobatic. Also perch, hover, and hang upside down. Diurnal. Active and conspicuous. Search for plants in bloom most of the day. Largely resident. Move seasonally with changes in rainfall and food supply. Occur singly or in pairs. Small aggregations near food or water. Nectar, insects, spiders, and fleshy parts of fruits and berries. Visit flowers of more than 20 different plant genera. Larger birds. Eggs eaten by snakes. Courtship: Males defend territories. Elaborate displays to females. May chase until he has the female's attention. Then sings, spreads his wings, and flicks his tail. Nest: Suspended from tree branches. Purse-shaped. Made of bark, twigs, dried grass, leaves, feathers, etc. Tightly bound with spiders' webs. Lined with feathers or vegetable down. Only female builds nest. Hatchlings: Only female broods. Fed by female and male. Likely eat insects and spiders. Visit sunbirds at the San Diego Zoo and Safari Park! © 2016-2018 San Diego Zoo Global. IUCN status updated Oct 2018. How to cite: Beautiful Sunbird (Cinnyris pulchellus) Fact Sheet. c2016. San Diego (California, USA): San Diego Zoo Global; [accessed YYYY Mmm dd]. http://ielc.libguides.com/sdzg/factsheets/ beautifulsunbird. Many thanks to Dr. Robert A. Cheke for providing expert content review of this fact sheet. Dr. Cheke is one of the world’s foremost sunbird experts. His work frequently takes him to sub-Saharan Africa, where he is able to follow his interest in sunbirds—a passion first ignited when he first visited Africa as a young student. Notably, his research more broadly encompasses connections between ornithology, entomology, health, and climate. As Professor of Tropical Zoology and Principal Scientist at the Natural Resources Institute, University of Greenwich (United Kingdom), Dr. Cheke studies the biology and control of vector-borne diseases and agricultural pests. He has authored 250 scientific papers and two books, notably the authoritative natural history guide Sunbirds: a Guide to the Sunbirds, Flowerpeckers, Spiderhunters and Sugarbirds of the World, for which he is now preparing a second edition with his co-author Dr. Clive Mann and illustrator Richard Allen. Also, thank you to Dave Rimlinger and Athena Wilson for sharing their knowledge of sunbird husbandry for the Managed Care section of this fact sheet. Mr. Rimlinger, Curator of Birds, oversees husbandry for Beautiful Sunbirds and a staggering number of other bird species at the San Diego Zoo. He is also deeply involved with the Zoo’s Avian Propagation Center, an off-exhibit facility for hatching and raising endangered and delicate birds. Ms. Wilson, a bird keeper at the San Diego Zoo, has spent a great deal of time caring for Beautiful Sunbirds and developing best husbandry practices for the Zoo. She created a Captive Breeding Review for Beautiful Sunbirds in 2011. Finally, to the many artists who granted permission to use their images—thank you for furthering the visual and educational quality of this fact sheet. Adult male Beautiful Sunbird, Cinnyris pulchellus, in non-breeding plumage. 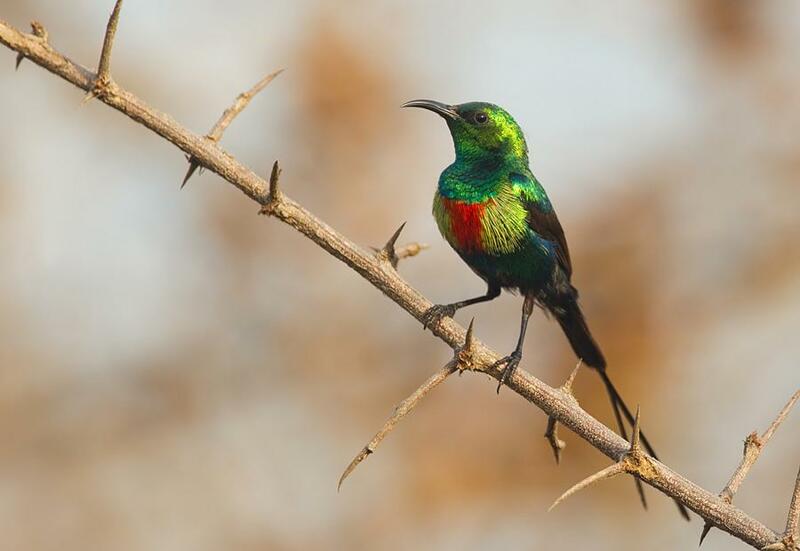 The coloration of the Beautiful Sunbird varies widely, even between sexes and age classes. See Plumage. Image credit: © Lip Kee at Flickr. Some rights reserved. Used with permission from the artist. 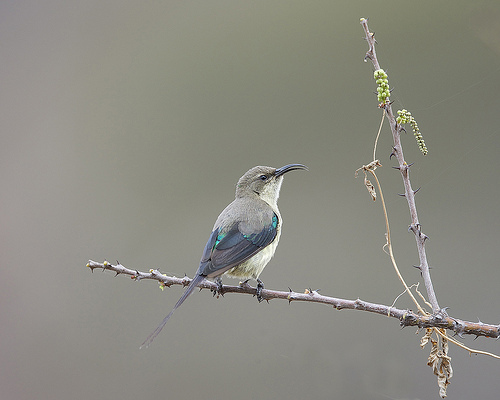 Image details: Taken 02 September 2012 in Tanzania.